Along with the change in players, Vici Gaming are also switching up their roles. Xu "BurNIng" Zhilei has been moved to the offlane and Sylar will carry while Bai "rOtK" Fan is headed to the support role. Kang "121" Jinming remains as coach, and Xu "JaL" Xiaoyun is the team's manager. 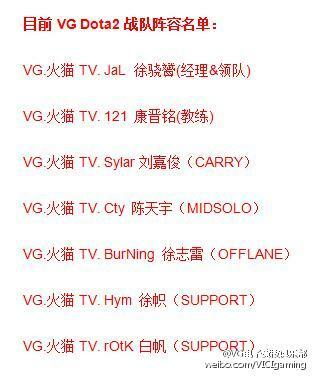 The addition of Sylar means that support player Jiang "jdh" Donghao is now without a team, and the VG post does not mention where he might be headed. Vici Gaming's performance since the Shanghai Major has been disappointing. They continue to struggle in H-Cup and lost to VG.Reborn in the upper bracket then CDEC Gaming in the lower bracket to place 7-8th in the Epicenter Chinese qualifiers. Most importantly, the change in roster after the lock means that the team will be forced to compete in the open qualifiers if they hope to attend either the Manila Major or The International 6.